Each quarter SWPP surveys the workforce planning community on critical workforce planning topics. Almost 180 call center professionals representing a wide variety of industries participated and provided insight into this quarter’s survey on workforce management for back office tasks. A similar survey was done in 2014 and the results are contrasted with this current survey to track changes over the years. Forty-six percent of the respondents in the 2018 survey work in centers with over 500 agents. The rest are representative of a wide variety of sizes from under 50 agents up to 500 agents. The financial, heathcare, and insurance industries drew the largest number of participants, but all other industries are also well represented. 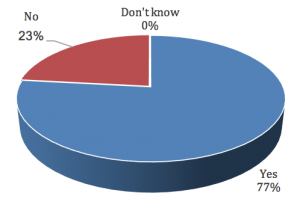 Respondents were asked if a request had been made for them to forecast or schedule for non-phone, back office tasks. Nearly three-quarters indicate that they have. This is a growing expectation of contact centers, especially the handling of email, chat, and other non-phone activities. In addition, the WFM processes are also being applied to departments with little or no direct customer contact to better manage the completion of their back office tasks. In 2014, 68 percent of respondents had been asked to forecast or schedule tasks for non-phone, back office tasks. When asked if the WFM team is responsible for forecasting work volume for non-phone, back office tasks, more than two-thirds indicated that they are. This is a slight increase from the 65 percent handling this in 2014. The respondents were asked if they are currently scheduling personnel for non-phone, back office tasks and more than three-quarters indicated that they do schedule these people. This is a slightly higher percentage than forecast for this work, suggesting that in some cases the workload is very stable or not highly predictable. The percentage of centers doing scheduling for back office is essentially unchanged since 2014. 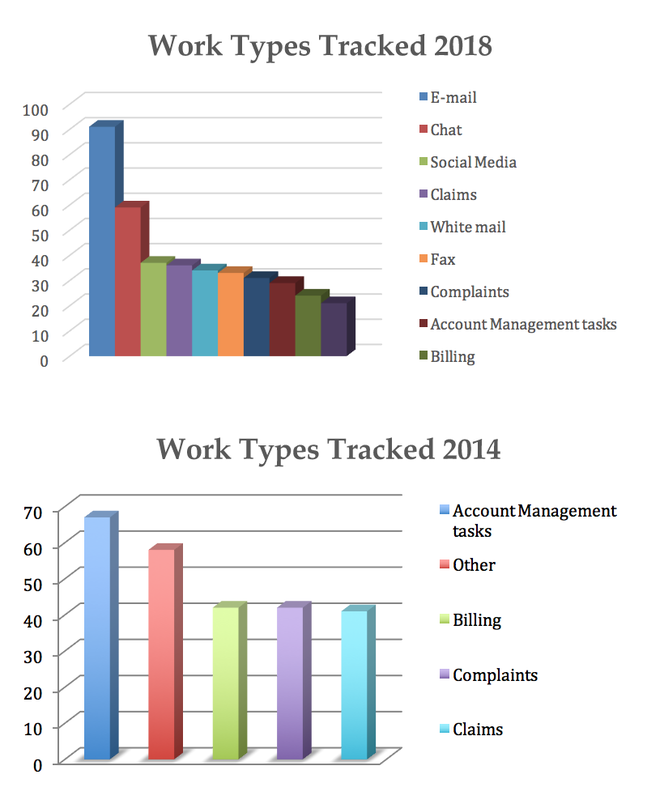 The respondents were asked to identify all the different kinds of back office, non-phone tasks that they track. 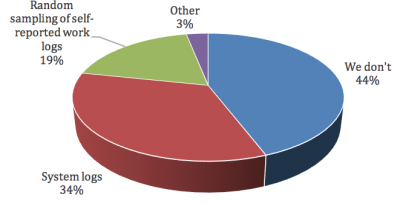 Email was the most common selection (chosen by approximately half of the respondents.) Chat was the second most selected type of task with a significant drop in those who do the remaining types of work. The responses have shifted significantly from the 2014 survey, in part because the choices to select from were expanded to include email, chat, and social media. Those who are tracking the workloads in various off-phone tasks were asked to identify the techniques used to track this work. The most common response was an operational system (typically one used for handling that type of work.) The second choice was a proprietary, home-grown system, often necessitated by the unique characteristics of the tasks and/or systems in use. Vendor solutions were the third choice with only a few noting tick sheets or “other” options. 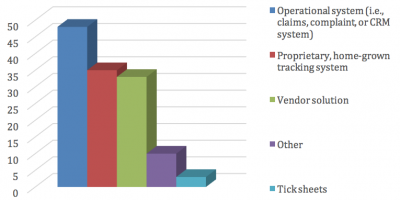 The distribution of tools utilized for tracking has not changed significantly since the 2014 survey. Respondents were asked how they report daily statistics for the work types handled. Over 60 percent reporting both by agent/staff member and by work type. Twenty-nine percent report only by work type with just 10 percent reporting only by agent/staff member. There is good reason to report both sets of data if the information is available as the work stats will help to forecast and schedule and the personnel stats will help with management of the staff’s performance. Compared to the 2014 survey, the percentage reporting by work type only has increased slightly from 23 to 29 percent with an offsetting drop in those reporting both. 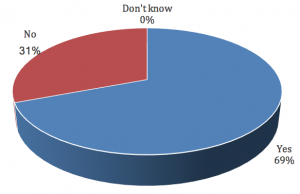 Respondents were asked if/how they validate the information that is reported by the staff in terms of the work handled. 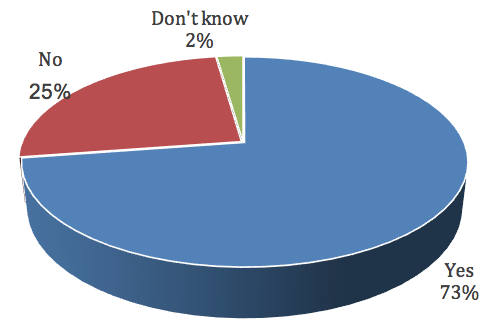 The largest percentage (44%) indicate that they do not validate the information provided. Approximately one-third indicated that they have system logs that can be used to compare the statistics while 19 percent indicated that they perform random sample tests. For most operations, manual self-reporting tends to be difficult to validate and often inaccurate. It is like asking agents to use activity codes on contacts to indicate what tasks was performed. Some agents are very conscientious and will record each contact with a high degree of accuracy. Others will use the same code on nearly every contact, or not report anything. It is often most accurate to identify the conscientious agents and ask only them to do the reporting and use it as a statistically valid sample for the rest. The responses in the 2014 survey were very similar. Respondents were asked how they measure adherence to the planned schedules. Nearly half use a vendor-provided WFM system for this task, while another 9 percent use a home-grown WFM system. 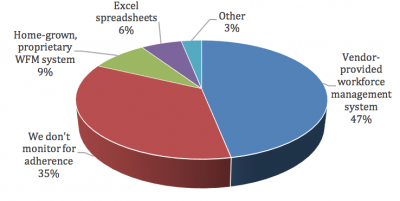 A few use spreadsheets, but 35 percent do not monitor for adherence. Where the work is done within the contact center environment, and often by agents who also handle phone contacts, schedule adherence may be critical to meeting service goals. In totally back office environments, there may not need to be as much emphasis on adherence to the details of the schedule as whether the company received a day’s work for a day’s pay. The percentage reporting use of a commercial WFM system has dropped significantly since the 2014 study when it was 57 percent. Respondents were asked what factors they use to determine staff effectiveness and they could select more than one choice. 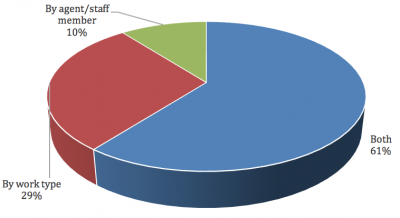 Most selected supervisor observation followed by yearly performance reviews. 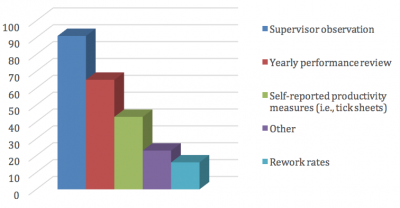 Self-reported productivity measures were the choice of approximately 40 respondents (out of 179) with rework rates and “other” by only a few. This does not appear to be much changed from the processes applied in back office environments historically and the results are very similar in the 2014 survey. 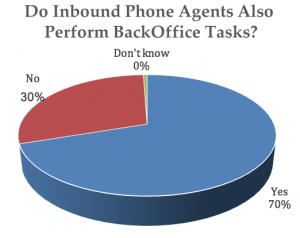 Respondents were asked if their inbound phone agents also perform back office tasks and over two-thirds indicated that they do. However, 30 percent of the respondents indicated that their phone agents do not handle these other types of work. 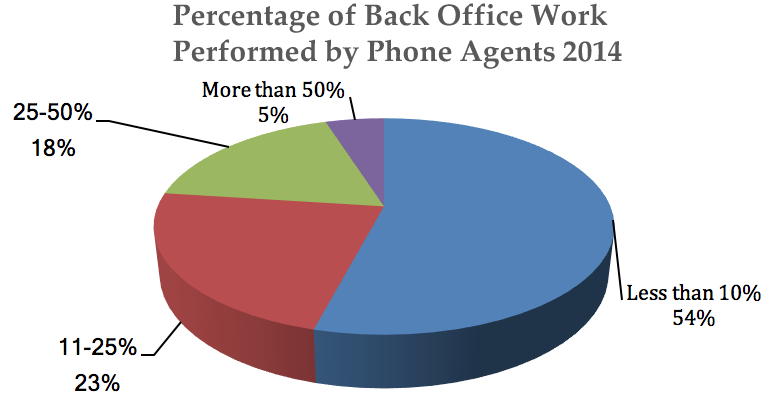 When asked what percentage of the back office work is performed by phone agents, the responses show this is relatively small with nearly half indicating it is 10 percent or less. It is certainly beneficial to having the option to utilize cross-trained personnel to do whatever type of work is needed at any time, but it is more difficult to recruit, train, and manage multi-tasking personnel. 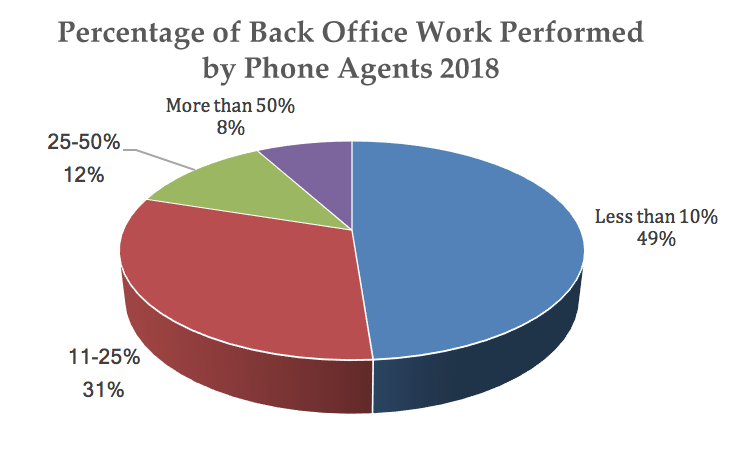 The percentage of respondents reporting that their agents handle both types of work has increased from 62% in the 2014 survey and the percentage of the back office work they do has also increased. Based on the responses above, non-phone work is becoming more commonly a part of the role of contact center agents and of the WFM responsibilities. While the total amount of non-phone work may be small compared to the phone tasks, it is important to both customer satisfaction and ability to offer multiple contact options to the variety of preferences of the customer base. While there does appear to be development of forecasting and scheduling for the personnel who do this work, other management techniques appear to be less sophisticated than those used for tracking call handling personnel performance. There is also some indication that vendor offerings are not as frequently used in this type of WFM role with a significant percentage of centers choosing to create their own systems or rely on operational systems and manual processes.